Like leaves on an endless vine, true love is timeless, eternal, and knows no boundaries. 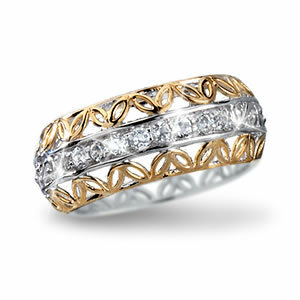 Express your infinite love with this stunning Sterling Silver eternity ring created by master-jeweler Thomas Sota. A row of brilliant White Topaz adorns the center surrounded by a delicate filigreed leaf motif, lavishly plated in 14K Gold. A true expression of never-ending love...for yourself or for someone you love. A Perfect Gift from the Heart. Ring is 3/8 inches wide, and 1/8 inch deep.